Volleyball assistant scorer is also referred to as the libero tracker. In this example, the second libero replaces the starting libero. 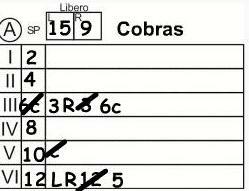 Write an R next to the L.
When 12 returns to the court, they must replace the libero. You will slash numbers of player substitutions. In this example, 5 substitutes for 12. 3 also comes in for 6. If the second referee doesn't tell you who the new floor captain is, you need to ask the second referee who is the new floor captain. When you are told it's number 10, you will write a C next to 10. When 6 comes back into the game, you will slash the C that's next to 10. Whenever the starting captain in on the court, he or she will be captain. As the volleyball assistant scorer, you need to be alert for improper libero replacements. The following are improper replacements. The replacement libero for the first rally of the match is not the starting libero. The wrong regular player replaces the libero. There isn't a completed rally between replacements. These replacements become illegal when the ball is contacted for serve. At the moment of service contact, notify the second referee that an illegal Libero replacement has occurred. If a libero is active, that team may not re-designate a new libero. If a team re-designates a libero, neither of the liberos noted at the beginning of the match may play the remainder of the match. If a team began the match with two liberos, once re-designation occurs, the team may have only one active libero from that point forward. 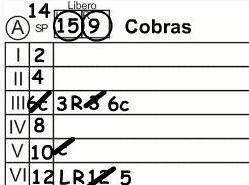 If the libero has been re-designated, circle the number of the libero being replaced and record the number of the new libero next to or above the circled number. Repeat these actions for the remaining sets in the match. A new libero may not be re-designated if there were two designated liberos at the beginning of the match and either of them is still active. Write the team on your left, on your left and in the far right section. The team starting on your right goes in the middle section. Write the appropriate A or B designation next to the team name. Record the line up numbers in the right boxes. 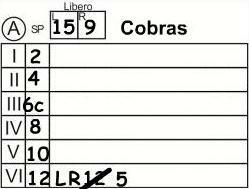 As the team on the left makes substitutions, subs are recorded on both the left column and right column. When a team reaches 8 points and teams switch courts, libero replacements may not take place until after the court switch. 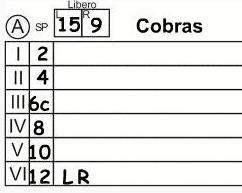 If the libero on the left is on the court when the referee directs the teams to switch courts, you will transfer the appropriate libero letter to the far right section. After the teams switch courts, you can ignore the far left section of the sheet for the remainder of the set. At the conclusion of a time out, ensure the same players that were on the court at the beginning of the time out return to the court before any libero replacements. During a timeout, communicate the following information to the second referee. Whether each team's libero is on or off the court. Which libero is on the court if the team has designated two liberos. After the court switch of the deciding set, ensure the correct players are on the court before any libero replacements.